So much evil in this world exists because of complacency. Jesus disrupted complacency wherever he went. Because in the world God is creating -- the world Jesus died for -- all are cared for, counted, and loved; no one is illegal because we are all human beings; no one is objectified because we are all children of the same God; no one is without because all creation is held within the circle of God's embrace. Does that world seem far away? Yes. Does it seem within reach? Yes. Is it what we are called to help make a reality? Yes. So what are we waiting for? Listen to or watch Pastor Danielle's full sermon on Sunday, January 21 below. In all honesty . . .
During the Advent and Christmas season, I have to confess, I became a bit overwhelmed and got behind on these Sunday posts. I recorded many of the sermons and took many pictures during that time, and I plan to catch up and find a good way to share them online soon. Sorry for the gap here, but we're getting back to it, and also are working on some new ways to share sermons with you coming in 2018! It's the weekend after Thanksgiving, and while many members of our community were likely still resting from successful Thanksgiving meals, traveling home from family reunions, or working to make up for extra days taken off for the holiday, many also gathered at Advent today for worship and community. Pictured left, our Sunday Singers (a more casual version of the Advent Chorale with just one rehearsal the same morning) sang a upbeat, fun tune at 11am worship. 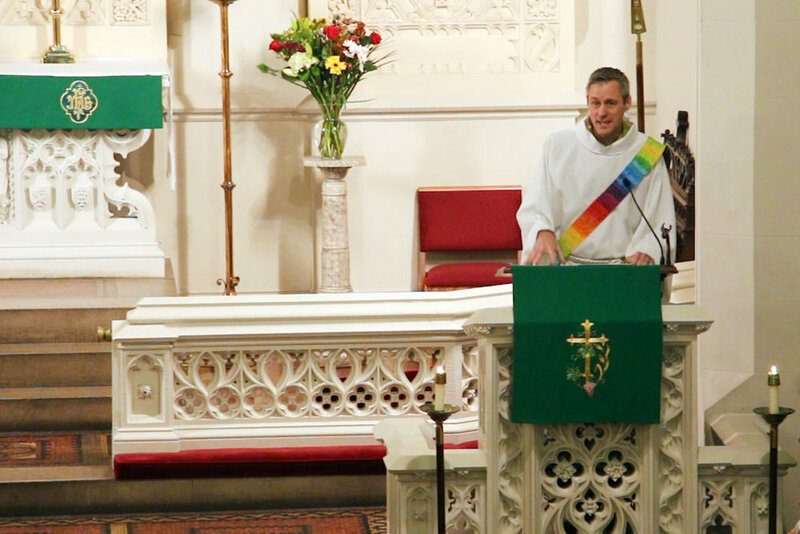 In his sermon, Pastor Gary reconciled the Lutheran theological tenet of "grace through faith alone" with a Gospel text that focuses on the importance of our works, how we engage with the world and treat others. Listen to the full sermon below. We hope you had a wonderful Thanksgiving! See you next Sunday! Pastor Danielle shared the mission and ministry announcements for the week. Sign up to help out and/or sing Christmas Carols at this coming Saturday's Christmas Tree Sale fundraiser here. If you plan to and haven't yet, you can complete your 2018 Stewardship Commitment card online here. Today was our third Celebration Sunday of the fall, with the theme: Thanks-Giving. 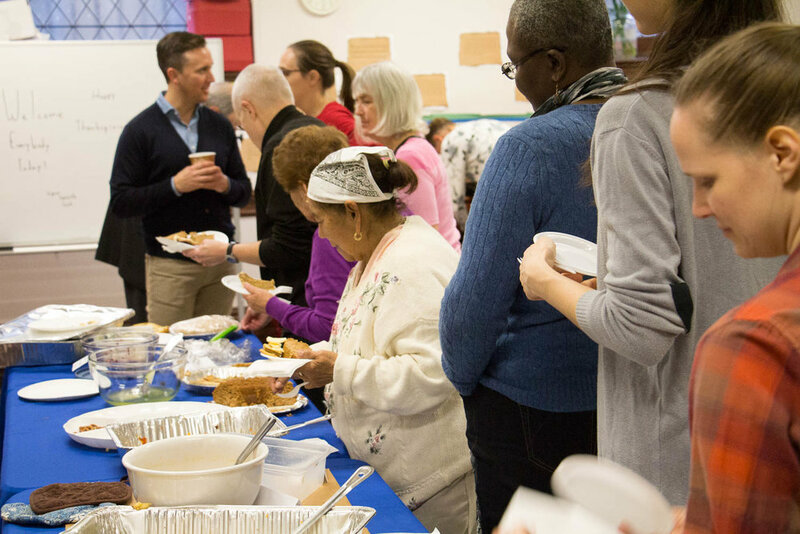 We were invited to give thanks in special ways in worship, gathered for an intergenerational Sunday School at 10am, and for our own Thanksgiving meal in community at 12pm. 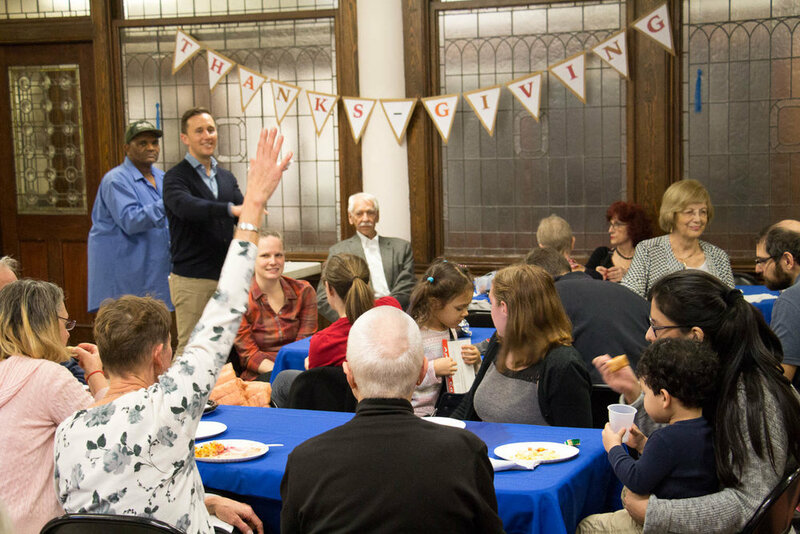 Our Thanks-Giving potluck included a pie auction, which was a big success and a lot of fun! In today's Gospel reading, Jesus and his disciples arrive in Jerusalem. The disciples ooo and ahh at all the grand temples, to which Jesus responds with a parable about running out of oil (surprise, the oil symbolizes something . . .). Deacon Ross Murray breaks this symbolism down for us and brings it to life in our context 2000 years later. Today we lifted up all the uncelebrated, unnamed, unknown saints throughout history and today: people of color, women, LGTBQ, transexual, differently abled, and more sharing their gifts with the world and loving their neighbors. Once Luther discovered in the Bible that God forgives and loves all people, not because of who we are but because of who God is, Luther knew he had to tell everyone. Today, there are still a lot of people who need to hear they are loved in the honesty of who they are . . . who is telling them? In her sermon on the 500th anniversary of the Reformation, Pastor Danielle calls you to follow Luther's lead and raise up your voice to proclaim that our God is one who loves everyone. Because somewhere, your voice is needed. 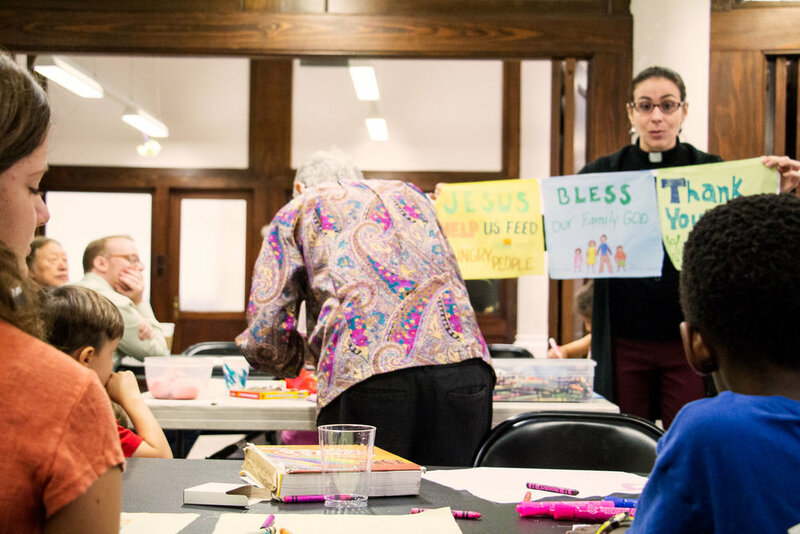 This Sunday featured our first intergenerational Sunday School! 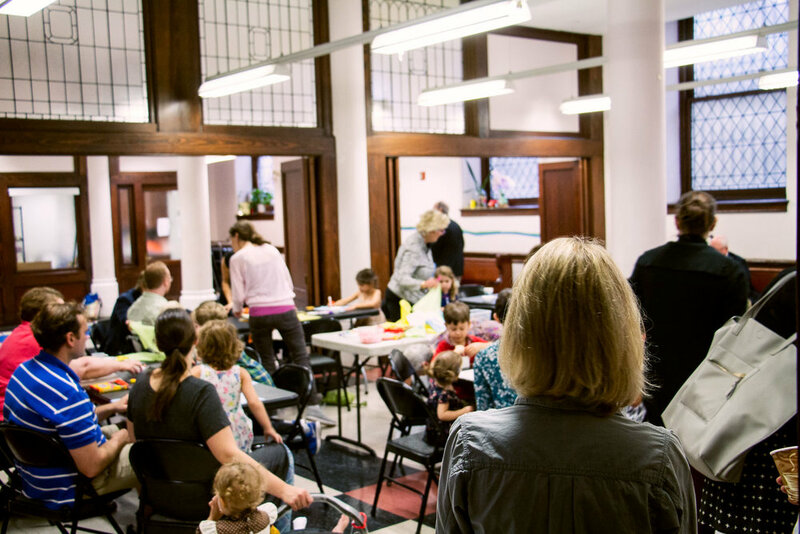 We'll have one the third Sunday of every month from 10-11am, and disciples of all ages are invited. Crafting, dancing, and coffee. 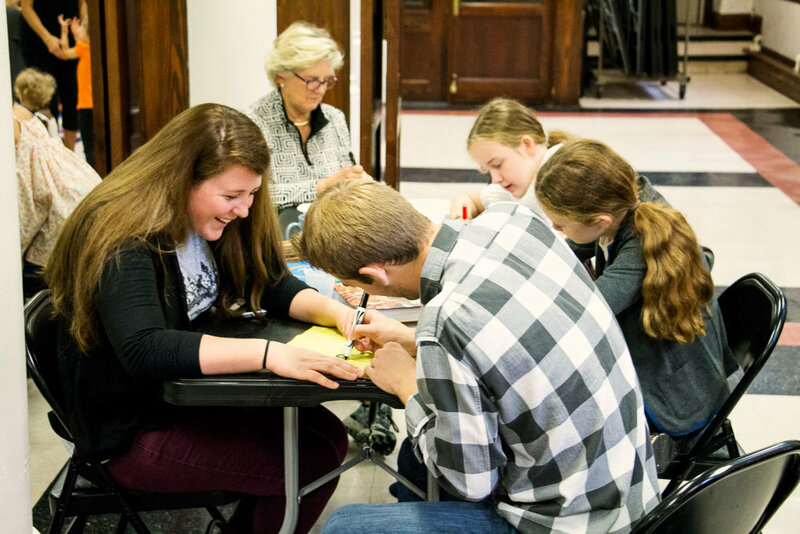 Intergenerational Sunday School creates an opportunity for our whole community of all ages to explore faith together. We had our first one today, and these will continue on the third Sunday of every month from 10-11am. Join us next time! Our youth group is getting ready to install an epic mural evoking themes of acceptance, diversity, and inclusivity on the front doors of Advent. Today they warmed up with the Sunday School room. On a rainy fall day, and the morning of Bobby Samuel's baptism, Pastor Danielle preached about how rain (any water, really) reminds her of her baptism, and why she needs to be reminded. The baptism of Robert Lee Samuel IV on Sunday at 9am worship. Today was a marathon of milestones. Pastor Sudbrock preached on the 56th anniversary of his ordination as a pastor. "I didn't create 'me.'" It was others. As I get older I think back to all the people who were go good to me in life. Now, I am called to give back to others." In his sermon on this special day, Pastor Sudbrock puts his own "accomplishments" into perspective, and focuses instead on owning and addressing the grim realities of white privilege. God loves all people unconditionally and equally, and God calls us to cry out and take action when that reality is not reflected in our society. Listen to the full sermon below. Pastor Sarah Brown baptized her own granddaughter. Pastor Sarah Brown is a member of our congregation who happens to also be a pastor. Many years ago, it was another member of our church, Bill Ellis, who encouraged her to become a pastor. She doesn't often participate in a pastoral role in our congregation, but today she did, and in a very special way. Today she baptized Vivian Quinn Truitt-Brown, her granddaughter. Quinn's family and godparents gathering around Sarah and Quinn at the baptismal font. In the silence between the practiced words of the Baptismal sacrament, you could feel how special this moment was for Sarah. In the words and water, you could feel God present and at work, affirming Quinn as God's own, blessed, forgiven, loved, called. 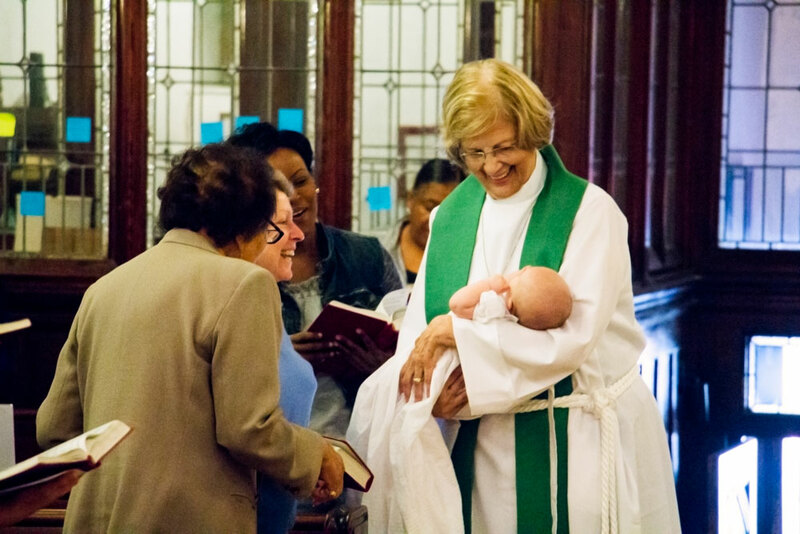 Our tradition after a Baptism is that the pastor "introduces" the baby to the congregation by parading them down the center aisle of the sanctuary. As she presented her baptized granddaughter to her faith community, the whole time Sarah was wearing one of the biggest smiles you've ever seen. We celebrated the life of Alicia Papaleo. Alicia Papaleo was a pillar of this church for decades and a life-long Puerto Rican Lutheran. She passed away at the age of 98 on August 24, after a long battle with Alzheimer's disease. Today we celebrated Alicia's life just the way she would want us to -- with worship. Listen below to Pastor Gary's bilingual sermon about Alicia and today's Gospel text, followed by the congregation singing one of Alicia's favorite hymns. To Alicia, remembered and loved by her friends here at Advent. And finally, we officially installed Pastor Danielle as the senior pastor of our congregation. Pastor Danielle has been serving as our senior pastor since May -- so why is this installation such a big deal? It's not just that pastors and church leaders from all over the city (and beyond) come to witness the beginning of this new era in Pastor Danielle's ministry and Advent's leadership. Dozens of Advent members came early to help prepare for the event. When the Chorale sang, you could hear more excitement and passion in their voices than perhaps ever. "People sing fuller when their hearts are full," Aaron (Chorale director) said afterward. When the service was over, you could see the joy lighting up everyone's faces -- a congregation moved by the present and giddy about the future. 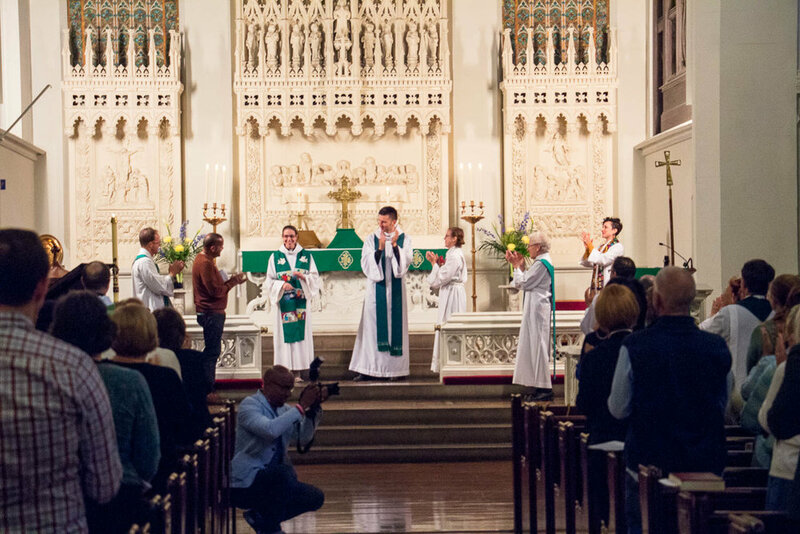 This installation ceremoniously marked a new beginning for us, for this community, for Advent. Celebrating that together was incredibly special. The Holy Spirit has breathed a fresh breath of life into this congregation through Pastor Danielle, and throughout this congregation so many of us can viscerally feel this new life, vision, and conviction to do God's work in the world in bolder and bigger ways. Hallelujah, Advent! Now, let's get to work. Preparations begin . . .
A gigantic procession of pastors and Chorale singers wait eagerly in the back as Pastor Gary says a word of welcome at the pulpit. The service is about 2 seconds away from starting. The procession comes down the center aisle. Pastor Ann Tiemeyer, an Advent member who served as our interim senior pastor, greats old friends. Pastor Danielle climbs the steps to the altar. The service included wonderful special music, by this trio from Pinecrest (a youth leadership ministry Pastor Danielle also leads), and the Advent Chorale. Advent members participated in the service in many ways, including reading the Word. Pastor Danielle gets a break as her friend Pastor Stephanie Kershner is about to preach. Pastor Stephanie Kershner, a friend of Pastor Danielle's and former seminary intern here at Advent, preached at the service. You can listen to her sermon below. The official installation begins . . .
Congregants and all gathered are invited to lay their hands on Pastor Danielle for a blessing. The service ended with Pastor Danielle presiding over Holy Communion. Afterwards, people were all smiles.